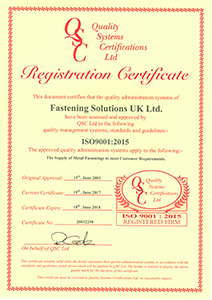 Fastening Solutions, leading supplier of threaded brass inserts for plastics and captive fasteners, are pleased to announce that they have been ISO 9001:2015 certified again this year. Our entire range of threaded brass inserts products have full batch traceability. Download the ISO 9001:2015 PDF certificate here.